I am pretty sure I beat the Thrawn Legendary event the first time around with G8 & G9 Phoenix Squad using my arena mods. It wasn’t easy, but it wasn’t anything like this event. @Austin9370 I'm assuming you're a whale so speak for yourself buddy. Give the fact that we got nothing but a ton of Marquee characters over the last few months, I would say that people did expect an easy legendary event finally, especially when it's such an iconic character that we all love. So get outta here with your anti-entitlement speeches, we could 7 star any legendary with g8 characters so far. They could have made it 10 but not 12 that's just ridiculous. Assuming makes a būtt out of u and me. I dont even have a 7* Bossk yet and I've only got a 7* legendary on the first attempt once. I'm no where near a whale....I did splurge and buy the Jango 9.99 pack though. I felt bad about it afterwards. My team is g12 boba, g11 IG-88, g11 cad bane and g9 Greedo, g9 Zam. I would say I expected it to be enough. Lol, really....who is going to absorb damage on that team? Surprise, you won't get it...no matter what you do...with that team. Nobody cares about arena? That was a giggle. That’s not how legendaries have worked in the past. People would be able to unlock at 5* no problem. The challenge came in the 7* fights. That’s where the difficulty should be. Requiring multiple zetas, G12+, god mods and the new BH isn’t the right way. But call me old school i guess. No, some people could unlock at 5* no problem in the past. Many couldn't. Same as this time. I can't get him this time, as even with a 2.8m gp I've only focused on the original bounty hunters, and only recently. I'm not surprised that this event requires characters who have been in the game years to be g11 & zetas as where would the challenge be if anyone who had been playing the game for a year or so would effectively get him by default. If you’ve been playing the game for a year, you get all of the other legendary characters “by default”. And it isn’t default, you still have to farm the shards and gears. That’s a year of dedication and daily playing invested in the game. This is just being **** for atupid’s sake. It’s a betrayal of the expectation for legendary characters and an insult to the regular players of this game. It’s another example of letting the rich get richer and punishing the masses. The people that already beat heroic sith raid and max out arena metas witll get the new “best” character. Everyone else continues to get dumped on. I didn't get Thrawn by default. Or CLS. I made different choices so that part of my roster wasn't up to scratch at the time both first came up. Yours were I'm guessing, so you've assumed you'd be fine this time round. I didn’t get CLS on the first try, but that’s only because I didn’t have Old Ben (a character that had been around but I didn’t farm). That’s the point. The limiting element has always been the characters - not maxed out gear/mods. If you spent the time to get the characters to 7* and get them to a playable gear level, you got the legendary character. That’s how the game has always played. Until now. And that stinks. You're ignoring the fact as it was always a 'panic farm' to get the needed character on it's initial release. You seem like a never player so that may not have been your reality. Everyone already had BHs, so this event was gear as the limiting item that needed to be panic farmed. Of course, Bossk too and I've noticed many have ignored him. Why? I have no idea. Remember when you nerfed a lot of content in this game because you felt that it went against the 'spirit of the game'? Oh yeah you do, then how can you justify putting out an event like the Chewbacca legendary. We knew that you were going to make it hard because people already had bounty hunters farmed and needed to monetise the event; however, this cash grab goes beyond all else. CLS and JTR are much better characters than Chewbacca and they required less gear to acquire. You have simply lost touch with your game, this event is beatable 7* but with a FULLY geared (not the 'well geared' you stated last week), god mods and incredible rng. I’ve been playing since a couple months after launch. I predate the existence of guilds. I have seen my share of legendary character launches. I know how they work. So what, it's not a game ? A game is supposed to entertain us, have FUUUUN, but now it's just very disgusting !!!! So 5-Star Chewbacca is (a lot) harder to get than the 5-Star Emperor of the entire galaxy? Or any of the other legendary characters for that matter? CG really choked on this one. Just coughed up a huge furball. zBoba on g12, on lvl 7 died before his first turn!!! Wasn't it obvious that this event was going to be different? I really think it was, for reasons I mentioned earlier - the FTP BHs nearly every experienced player will have were never going to work at below g10. It's a business - they want the paid for characters to be more effective. That's fine by me, as a FTP - I accept I generally ain't getting things first time. And I'm not typing this from a position of smugness in that I geared the FTP up to g12 because of my amazing foresight - I didn't, and barely make a dent in t5. Then I'm more confused as you should have a deep enough roster to focus on BHs and their gear. I mean they are a great TW and required TB team. Did 7* tier on the 2nd try. Bossk is indeed g12+3. zzBossk (L), Cad, zGreedo, Dengar, zBoba. All G12 (+3/+1), 3 of them with arena mods, 2 of them with ok mods. Edit: not much rng as others said. Just used dengar AOE for recover and with stealth is safe. Bossk soak up the damage. So, Thrawn, requires no Zeta's ect. G8 barely, and all that. This requires FOUR Zeta's, G12 and over and super mods and a recent P2W character and its what, low on RNG? CG: This event will be challenging. Me: Ok, my G10-12 BHs should make it. Bossk is Chewbacca’s arch rival by the way, not Aurra Sing, Embo or Jango. He’s the best tank in the game, and many of us took him to get as close to that lineup from on the bridge of the Executor from Empire Strikes Back as possible. Timeline wise this event takes place sometime close to the events of Empire Strikes Back considering Rolo is there. The OG classic bounty hunters led by Bossk should’ve been the ideal group for this event. I'm curious to see what comps make it and I'll burn through my gear supply for a last ditch effort. If needed i can probably have 4 G12s and a G11 by the last day. Can't do it with my 3* Embo or Aurra Sing (or whatever her name is). No 5 star legendary should require significantly higher gear than a 7 star legendary. Well, one good thing, all the people complaining is what gets them to fix things, they better make this fight easier or they won't be making their people happy, and unhappy their people means unhappy devs. Its a veiled marquee event after all!!! My fave recent dev quote "We like that players can use all their iconic favourite characters"
"People like setting their own goals"
"People like using whatever they want to use"
And then events like this come out. You don't, really, just good RNG. 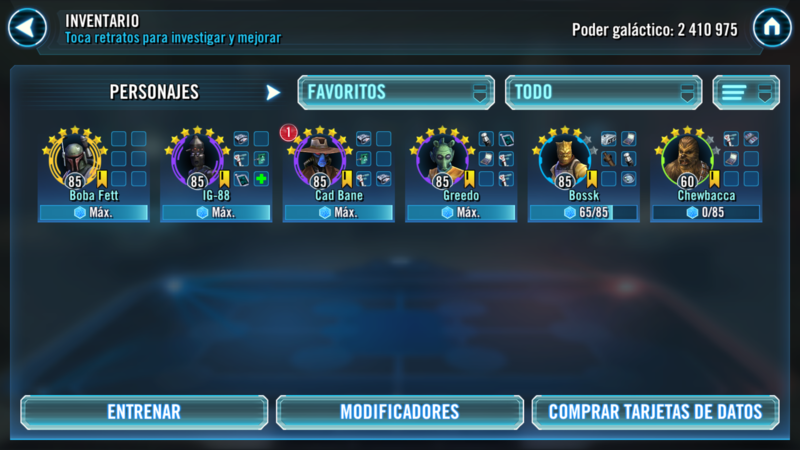 This is the team I used for the 5* (with arena lvl mods), only omegas on Boba.